New features like enhanced RXJS, faster compilation (in under 3 seconds), new HTTP Client launch. MVVM (Model-View-View Model) that allows developers to work separately on the same app section using the same set of data. Easy to learn. React is much easier to learn because of its simplicity in terms of syntax. Engineers just need to recall their HTML writing skills and that’s it. No need to deeply learn TypeScript like in Angular. Migrating between versions is generally very easy, with Facebook providing “codemods” to automate much of the process. better acceptable by web browsers while parsing different elements of the web app. Combined with ES6/7, ReactJS can work with the high load in an easy way. Absolutely light-weighted because the data performing on the user side can be easily represented on the server side simultaneously. React JS requires deep knowledge of integration of user interface & MVC framework. Empowered HTML. This means that Vue.js has many similar characteristics with Angular and this can help to optimize HTML blocks handling with a usage of different components. 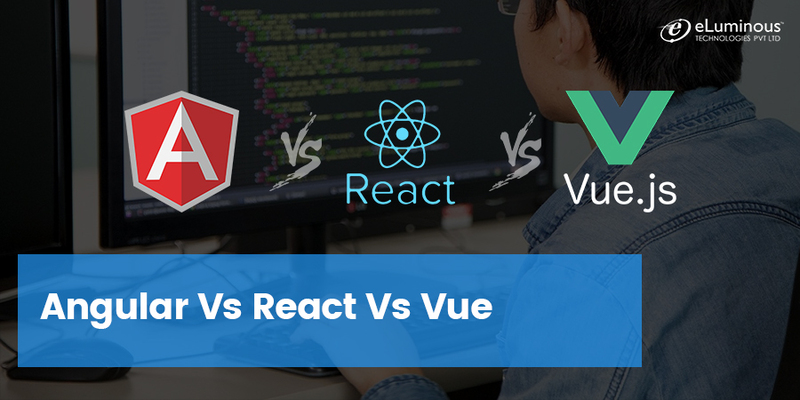 It provides a rapid switching period from other frameworks to Vue.js because of the similarity with Angular and React in terms of design and architecture. Large scaling. Vue.js can help to develop largely reusable templates that can be made with no extra time allocated for that according to its simple structure. Splendid integration. Vue.js can be used for both building single-page applications and more difficult web interfaces of apps. The main thing is that smaller interactive parts can be easily integrated into the existing infrastructure with no negative effect on the entire system. Share your requirement with our expert front-end web developer or comment below & get the best assistance for the same.